Ducted air conditioning is a convenient and discreet option for cooling your home. You can control the climate in multiple rooms using a single system, with quiet operation and no bulky units taking up wall space. 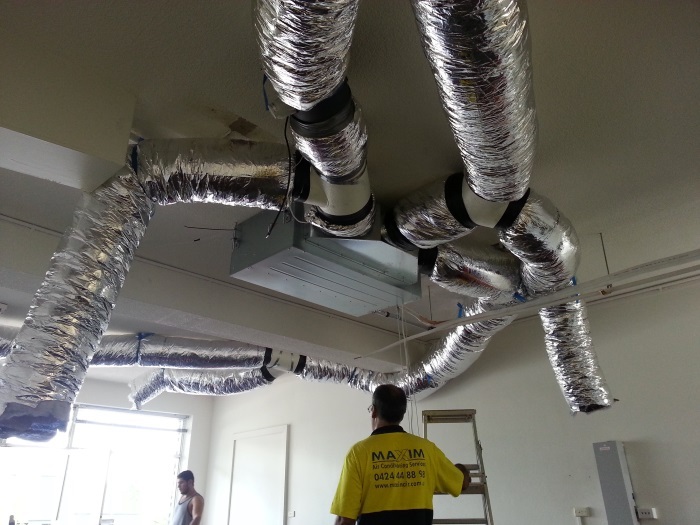 Maxim Air supplies, installs and services Ducted Air Conditioning in Hills District, North Shore, and all Sydney metropolitan areas. If you're installing air conditioning in your home for the first time or replacing an older installation, ducted systems can be installed in most buildings. Discreet – Ducted systems are mostly hidden inside your ceiling and walls, with only the grilles being visible. They're also whisper-quiet, making them ideal for bedrooms and study areas. Convenient – A ducted system can connect to as many rooms as you need it to, so you don't need to install individual units in different parts of your home. You can adjust temperatures and settings via remote control or smartphone apps, or set programmable timers. Efficient – Modern air conditioners are designed for superior energy efficiency. Ducting enhances efficiency even further, so you'll save on electricity bills while keeping cool all year round. Flexible – Ducted systems can provide both cooling and heating, keeping you comfortable in all seasons. 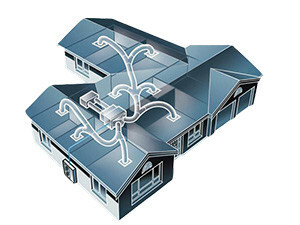 When you choose a zoned system, you can set different temperatures in different parts of your home. What are the different types of ducted systems? We install and service all types of ducted air conditioners from the leading manufacturers. Our technicians will recommend the perfect fit for your home during your consultation. Evaporative cooling is one of the most affordable and energy-efficient options for lowering temperatures and improving the air quality in your home. Unlike some other air conditioners, you can leave your windows and doors open to enjoy the fresh air as the natural breeze circulates through your rooms. Ducted evaporative cooling uses fans to draw air from outside the home, which evaporates and cools as it passes over water-soaked pads. This means the air inside your home will be slightly moist and won't dry out your skin, while filters will block out pollen and other allergens. If you live in a more humid area, or you don't want to leave your doors and windows open, refrigerated air conditioning could be a more suitable option than evaporative cooling. Reverse cycle air conditioners can also provide heating in the colder months. Refrigerated ducted systems lower humidity and circulate the air multiple times every hour. Filtration makes sure this air is pure and free from allergens. If you've already taken care of cooling, but you need to keep warm in the winter, ducted systems can also supply heat. We can install a reverse cycle air conditioner that can switch between warm and cool air or gas ducted central heating for rapid, energy-efficient heating. Ducted systems distribute heat more evenly than room heaters, as they don't use radiant heat. Instead, air from conditioned space is recycled through filters and then heated as they pass over combustion tubes and blown back into the space. Filters block out contaminants, leaving your warm air fresh and pure. If your Ducted Air Conditioning system develops a problem, you need to get it fixed as soon as possible. Not only may you have to endure uncomfortable temperatures, but your electricity bills could increase and mould and mildew could start to form now that the air's no longer being purified. When you choose Maxim Air professionals to install your new Ducted Air Conditioning, you'll be covered by the manufacturer's warranty if anything goes wrong. Our technicians are licensed to clean, service and repair air conditioners, and we'll get your system back online as quickly as possible. Just had a ducted system and a single unit installed by Maxim. The "whole journey" was an exceptional experience! - very approachable, competitive and reasonable pricing, accommodating to installation date, friendly staff including the owners, who are down to earth people. No need to look elsewhere! Amazing company. Well organised, great prices, even accept credit card payment. Could not recommend enough! I would highly recommend MaXim Air to anyone looking for ducted system. We spent a lot of time and effort shopping around, when we could have gone to the best and most competitive to start with. very professional . A joy to deal with from the initial consult to the installation. Thanks to Arran and Stephen for their excellent workmanship and customer friendly attitude. Right from the beginning of the process they always guided us about the right product for our home and kept us informed all along. We installed 18.0 KW ducted AC and the whole process was really smooth. There was some delay from my end in approving the quote but Arran still did his best to accommodate the installation dates so that my family can bear the unexpected hot weather in Sydney during the months of December and January. Thanks Maxim team. Very helpful and friendly, competitive prices. Installation team were customer focused and experienced... all arrived and finished on time. I would highly recommend. Installed a 12.5KW Daikin. Performs well. The team at MaXim Air are extremely professional and friendly. They provided expert advice and suggestions during the initial quote for a ducted system, which was also highly competitive. The installation went flawlessly, they even helped fix up a sagging ceiling when installing the ducted vents. They truly went above and beyond in making sure I was 100% happy with the job. I would highly recommend MaXim Air Conditioning. Arran provided expert advice and ideas (that no one else had suggested) for the initial quote for our ducted air conditioning. The quote was very competitive. We received reminders of the installation day via text prior to installation. On the day of installation Victor and his team arrived on the dot of 7am and worked all day until the job was completed. They were very conscientious and cleaned up thouroughly. Would highly recommend MaXim air conditioning services. Maxim recently installed 2 split system air conditioners for us and we were very pleased with their excellent service. Stephen and his team were efficient, hardworking, professional, and pleasant to deal with. We were impressed with the effort that the team went to in ensuring we were happy with the position of the units in each room, and making sure the areas were tidy and all rubbish removed after installation. The team was punctual and completed the tasks within the quoted time frame. We also were grateful for the quick responses to our queries. We would highly recommend Maxim. Thank you Stephen and team. Excellent service from the Maxim team. A bit late (due at 7am which is too early on a Saturday anyway!) but no concern as they did a great job and were very helpful. Highly recommended.